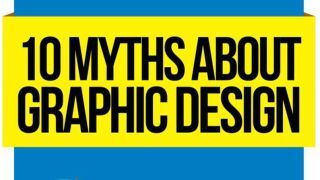 From cash-flow to clients, this infographic banishes 10 myths about graphic design. Before diving into the world of graphic design, you should know a few home truths. Just like any other career, working as a graphic designer certainly has its up and downs but this infographic from youthedesigner.com will help you to easily work out the pros and cons. Whilst some myths are pretty hilarious, you'll have to take others seriously if you want a long-standing career. Created by UCreative, this is one of the best infographics we've seen when it comes to tackling everything from time management, cash-flow and creativity. You might be surprised by some of the outcomes. How many of these myths have you encountered? If you're already working as a graphic designer, the infographic will serve as a handy guide for anyone that doesn't truly understand what you do day-to-day. Be sure to share it around!